NWCC is a small grassroots organisation. Formed in 1997 by local Carers who wanted more local support. Please note – We do not offer personal care. 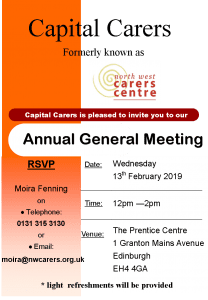 All Carers in North West Edinburgh get the help and support they need to sustain their caring role. Provide the highest quality support for Carers throughout the North West of Edinburgh. To reduce their stress and isolation. Our service is Carer-led, welcoming and attentive to individual needs. Are you one of the estimated 788,000 unpaid people who are caring for a relative, friend or neighbour in Scotland? or one of the 44,000 people under the age of 18 who classed as a Young Carer? Ensuring that we respond to individuals’ needs, wishes and beliefs. Based in The Prentice Centre, we offer services to Carers living in North West of Edinburgh. The areas we cover are the four Neighbourhood Partnerships; Inverleith, Forth, Western and Almond. Granton, Pilton, Drylaw and Muirhouse. Silverknowes, Davidson’s Mains, Cramond & Barnton. Clermiston, East Craigs & Corstorphine. Blackhall, Murrayfield, Roseburn & Ravelston. South Queensferry, Kirkliston and Ratho Station. If you are unsure if you are in our area, please contact us below. Provide a high-quality service that has Carers at the centre of what we do. We are a Carer-led organisation. We will listen to Carers and respond according to their views and needs, where possible. We will provide information Carers need. We will help Carers access to information, support and services. To enable them to maintain their caring role. We will provide services which are responsive and focused on Carer need. NWCC works with young people aged 5 to 18 years old, who care for someone at home – usually a parent, guardian, sibling or someone they live with. We run support groups for Young Carers, one to one support, peer support as well as signposting on to other agencies. R U A YOUNG CARER? A Young Carer is someone aged 18 or under who helps look after a parent, guardian, sibling or anyone living in the household with them. These individuals may suffer from mental, emotional or physical disabilities, have drug or alcohol issues. Most Young Carers look after someone who lives in the same house as them, this is either a Parent, Guardian or Sibling. The main aim of the Side By Side project is to help Carers and the person they care for, who are living with Dementia, or Cognitive Impairment to live well. The Side By Side project provides support to Carers of people living with Dementia or Cognitive Impairment through either face to face, or telephone contact and by organising and facilitating information, educational, recreational and practical courses for Carers and other courses and events where the Carer and the person they care for can attend together. All our courses are free. The project also enables Carers and the person they care for to meet others, share experiences and benefit from Peer Support. You think you cannot attend a course or event as you have no one to look after the person you care for, then don’t give up, call us as we may be able to help. ‘This work is supported with funding from the Life Changes Trust. We offer a service to give Carers a short break for a few hours. This service is for those who do not receive traditional day care services and are aged over 65. One of our support workers can visit at a regular time, usually weekly, to provide companionship to the person you care for, giving you the opportunity to take time for yourself. Carers in the Ferry is a support group for anyone supporting friends, neighbours or family members with physical and mental health difficulties, long-term and life-threatening conditions and people living with cognitive impairments. The group is a safe space for sharing the rollercoaster experiences of caring in a support group of your peers. We come together to share experiences, support each other, access advice & information, and learn skills to help us cope and also to make time for ourselves. This group is very informal and welcoming.